Erected beginning in 1891, the Keokuk Union Depot served the train-traveling public well for nearly eight decades. During that period the building was maintained in serviceable condition and underwent interior remodeling as requirements changed. With the cessation of passenger service to Keokuk in 1967, however, the structure was no longer needed for its primary mission. It was put to use for other purposes for which it was not intended, such as storage of surplus railroad equipment. 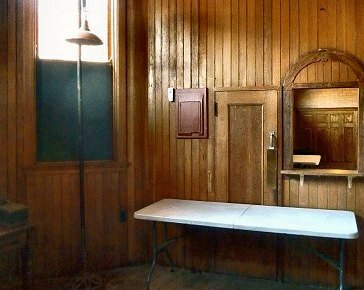 Except for a brief period when the Depot served as a base for the original Keokuk Junction Railway's tourist operation, during which the waiting room was renovated, the structure was neglected. 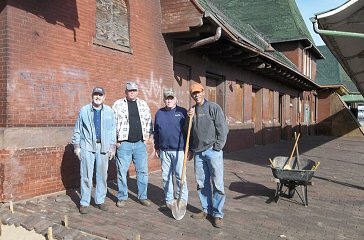 In 2011, however, responsibility for the Depot passed to the City of Keokuk and efforts are under way to restore this historic structure and enhance its usefulness as a community resource. This page highlights some of the ongoing efforts in that direction. The major activity of 2015 included the restoration of the eaves and gutters around the waiting room and the restoration of the chimney to its original height. This project was supported in part by the Iowa Department of Cultural Affairs' Historical Resource Development Program (HRDP); the contractor was Restoric LLC of Chicago. 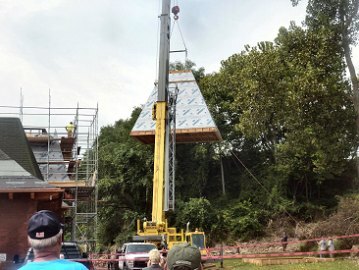 This was the first step in a three-phase roof restoration project for which the Jeffris Family Foundation issued a challenge grant of $333,000 in 2014. By 2016 contributors had matched the grant at two to one ($667,000) enabling work to go forward. In 2016 the eaves were restored around the remainder of the building. 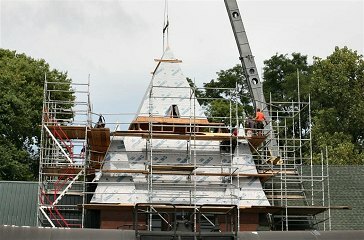 Earlier roof repairs were begun in April 2011. The contractor determined that a portion of the inside brick window arch at the front of the building had been weakened through leakage. 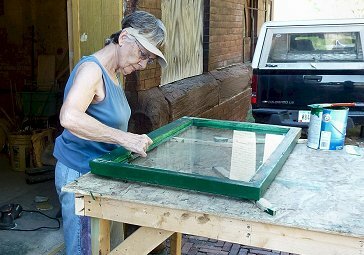 A woodworking firm made a new arch window casing, which volunteers completed and installed in June 2013. This window frame replaced the deteriorated frame in June 2013. To enlist as a Depot volunteer, email the Depot Commission. To donate to the effort, visit the Depot Foundation page. Volunteers reset frames in the northeast window, July 2012. 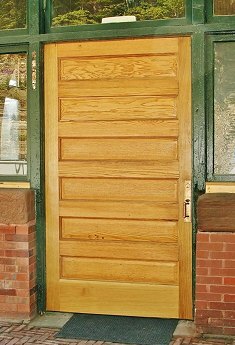 Visitors are welcome whenever volunteers are at work at the Depot. Workers will be glad to review our progress, discuss the history of the Depot, and point out important architectural features. Normal workdays are on Tuesday, Wednesday, and Thursday mornings. A job is always available for those unskilled in the specialized tasks occasionally needed, such as electrical work or carpentry. Locate the Depot on the map. Municipal tax moneys will not be used for Depot rehabilitation. 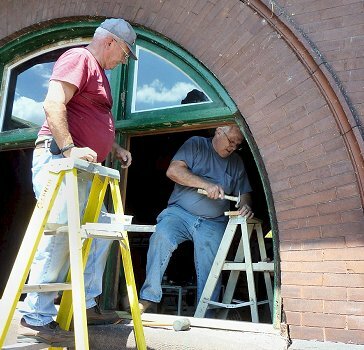 The Depot Commission of the City of Keokuk administers the general efforts, but the Keokuk Union Depot Foundation is charged with raising the needed funds. Viewers interested in supporting the effort may contribute through the Foundation, or send their contributions to Keokuk Union Depot, P.O. Box 463, Keokuk, IA 52632. The focus of activity in 2016 was the construction and lifting of the apex to the central tower, which had been leveled off around 1950. 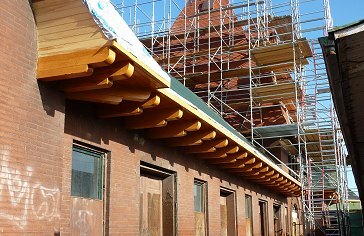 The Meyer Guild of Chicago, subcontracted by Restoric LLC, built the new apex on the ground. On August 31, 2016, McDowell Crane & Rigging lifted the apex to the top of the central tower, adding 26 feet to the height of the building. The central tower was rebuilt to provide additional support for the apex once it was in place. 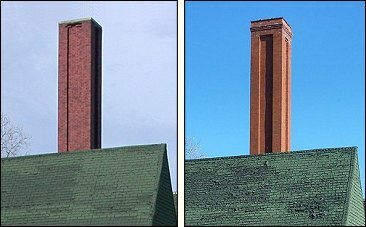 At the same time the four corner turrets, removed around 1950, were reconstructed. 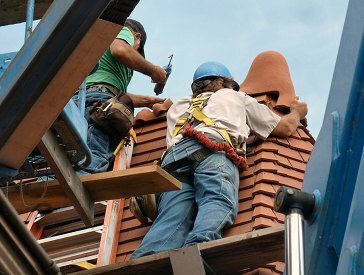 During the fall of 2016 the roof of the entire central tower was tiled, after construction of the dormers on both the track and bluff sides. (See the photos below and on the home page.) 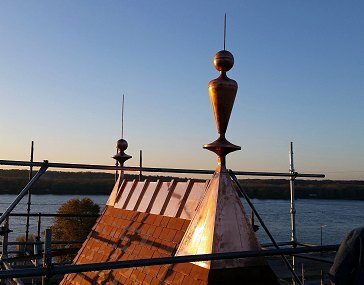 Brass finials were applied to the peak of the tower and the reconstructed corner turrets. Roof repair and tiling on the up-river and down-river ends of the building was undertaken in 2017, and completed in 2018 (see the photo at the bottom of this page). 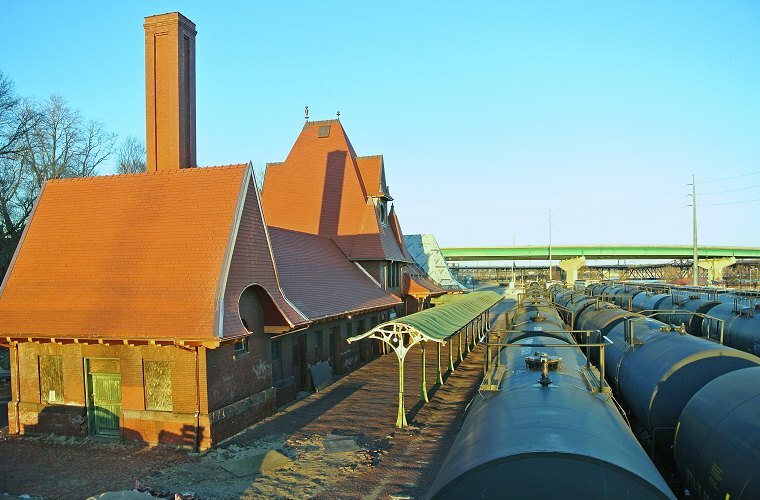 For more information about the roof restoration project, visit the Depot Foundation page. The 1891 plan for the Depot called for a clock to be installed in the dormer of the central tower, on both the track side and bluff side. No clock was ever installed, and until truncation of the tower in the 1950s the opening was filled in with wood. 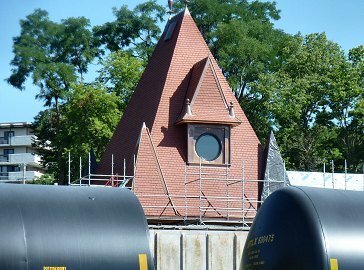 In 2017, after reconstruction of the dormers, the round window was glazed. 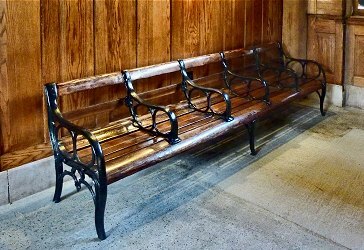 Original waiting room benches were present in the Depot until shortly before it was leased to the City of Keokuk, but by the time the City had full access to the building they had been removed. However, a friend of the Depot donated several benches appropriate to the period of the Depot's use in passenger service. Volunteers have painstakingly reconditioned them to restore an authentic appearance to this interior space. 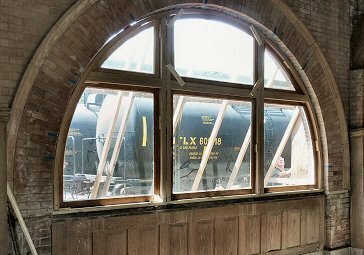 On March 8, 2012, Dwell Magazine, a San Francisco architectural publication, announced that the Keokuk Union Depot was the winner of the $10,000 "Rethinking Preservation" award sponsored by SubZero. The Depot topped a list of 118 entries on behalf of architectural landmarks. Christen Sundquist Martin, architectural intern from the School of the Art Institute of Chicago, entered the Depot in the competition because of its distinction as one of the few remaining depots designed by Burnham and Root. School students from the Keokuk area were instrumental in swelling the vote total for the Depot. A team from Dwell visited Keokuk in May 2012 and created a five-minute video, Preserving the Keokuk Union Depot. An article on the project appeared in the October 2012 issue of Dwell. The Dwell award underwrote the Historic Structure Report that guides ongoing restoration efforts. Motor vehicle traffic over the brick platform on the railroad side of the Depot, in connection with railroad operations, caused the paving to sink and form ruts. 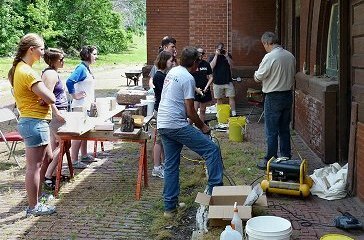 During the summer of 2012 the bricks were pulled up, new sand was laid down and leveled, and the bricks were reset from the northeast end of the building to the southwest, between the building and the platform umbrella support posts. In the photo below, volunteers pose on December 4, 2012 when that goal was reached. Volunteers pose upon completion of the 2012 phase of platform work. removes old paint from window frames in July 2012. The Depot photographed in December 2017, when most of the roof tiling had been completed.